God of War Stone Mason Edition Available for Pre-Order Today | Nerd Much? 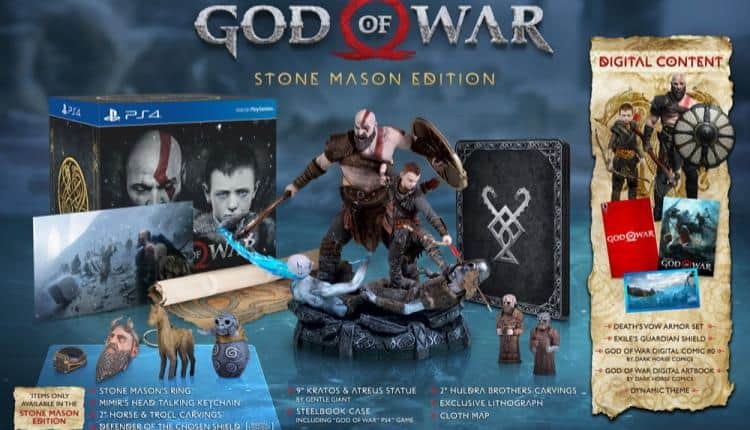 The God of War Stone Mason Edition includes a 9 inch statue of Kratos and his son. GameStop has revealed a special edition for the upcoming game God of War called Stone Mason. Most of the items included are to do with a stone mason, like the Stone Mason’s ring which has a wide gold and dark grey band. It is not clear if the ring is a precious metal or not. The next item is a Mimir’s head keychain that apparently talks. This is an item that Kratos carries on his belt, though we do not know how it works exactly yet. If it is anything like its Norse mythology counterpart, the head is like the heart in the Dishonored series and imparts secret knowledge and counsel. Next are two carvings, one of a small wooden-like horse and the other a troll with small blue swirls on its belly. Both are two inches tall and likely belong to Kratos‘ son. Another set of two-inch-tall figurines are the pair of Huldra Brother carvings. Until the game comes out, we likely will not know who these brothers are. Their Norse mythology counterpart is an extremely unlikely possibility, judging by their appearance in the game thus far, as Hulder are the Norse version of a mermaid. Femininity is a requirement, to say the least. Finally, we come to the main feature of the Stone Mason edition, a nine-inch Kratos and Atreus (the boy has a name). Both are mid-combat, striking the ultimate deathblow. Kratos, in his usual brutal fashion, has chopped off the head of his enemy. Atreus, showing off his skill with a bow, has a shot his enemy straight through one eye. In addition to the figurines is a steelbook case for the game, an exclusive lithograph, and a cloth map. Digital content for this special edition includes Defender of the Chosen Shield, Death’s Vow Armor Set, Exile’s Guardian Shield, God of War Digital Comic #0 by Dark Horse, God of War Digital Mini Artbook by Dark Horse, and a Dynamic Theme. The God of War Stone Mason Edition is currently up for pre-order at $149.99 USD and will release June 30, 2018. Hopefully, that is also a hint as to the release of the game itself, but it is never guarantee coming from a retailer. Want to know what other PS4 games are on the horizon? Check out our list of the 52 hottest upcoming games of 2018.